Chalk artists are invited to participate in the 2nd Annual Chalk It Up! Sidewalk Chalk Art Competition to be held on Saturday, February 23 in conjunction with the City of New Smyrna Beach’s 2019 Art Fiesta. Art Fiesta attendees can delight in strolling along Canal Street to view the chalk creations. The chalk artists will begin at the intersection of Canal Street & Sams Avenue and extend west along Canal Street. Please fill out the registration form and return to The Hub on Canal (132 Canal Street) in-person or by mail. On-site registrations the day of the event will be accepted as space allows. The event is free for artists of all ages! There will be a chalk pack for the first 30 registrations. School teams will all receive a chalk pack. Spaces (4 ft. x 4 ft.) will be assigned on a first come-first served basis. Monetary awards will be given in all categories. 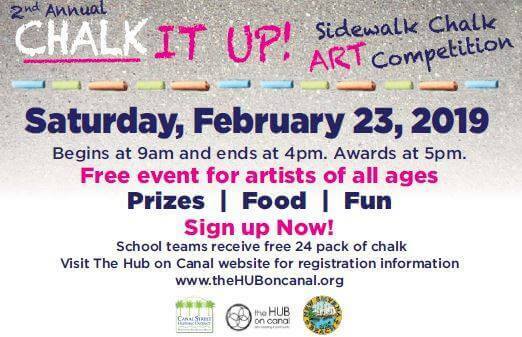 Chalk artists will all be competing for prize money during this one-day event as they create their masterpieces. Note: There will be water and snacks fro chalk artists. A light lunch will also be available at The Hub on Canal.